In a large heavy pot, brown meat on medium high heat , while breaking it up. Remove from heat, and drain the fat from the meat in a strainer, over a bowl. keep 1-2 tbsp of the fat for browning the cooking onions. Brown onions in pot with the 1-2 tbsp of fat, cook for 2 minutes, then add the garlic, ginger, ground beef, tumeric, cumin, allspice, cardamom, scotch bonnets, and thyme, cook over medium low heat for about 15 minutes. Add the green onions, parsley, tomatoes, and beef broth, and simmer on low for 20 minutes, until most of the liquid has evaporated. Season with salt and pepper to taste. Set it aside and cool completely, then put in the fridge until ready to assemble. * I like to make the meat mixture , and dough , then keep in the refrigerator overnight and assemble and cook the next day, that way it doesn’t seem like so much work and is good if you don’t have the time to do it all in one day. Of course when I make this recipe I multiply it by 4 so I can make them for the freezer, if you do multiply the recipe, you will want to do the dough in batches one at a time as it is hard to handle that much dough. 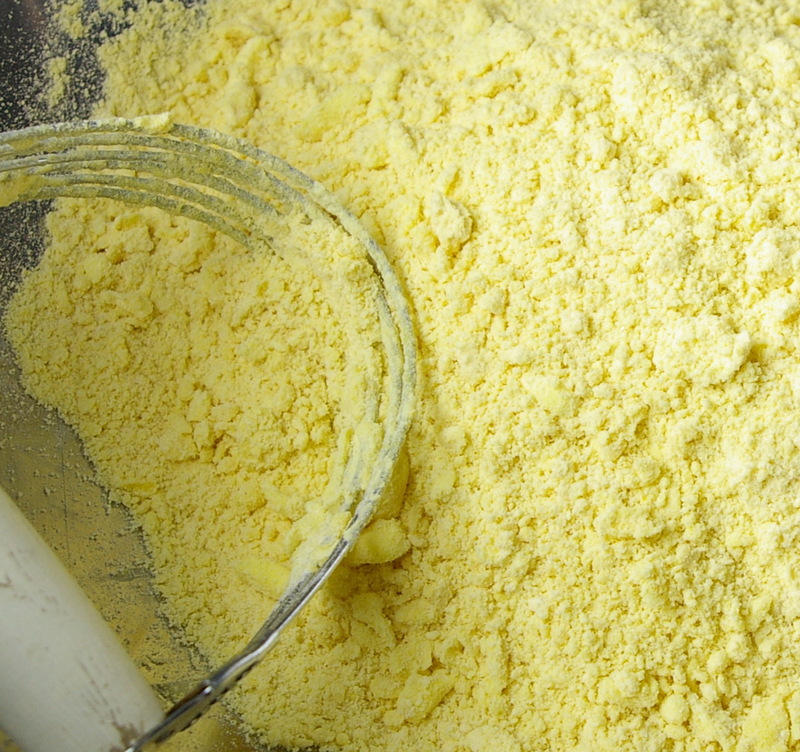 Sift the flour, salt and tumeric, over a large bowl . Use a pastry cutter or two knives and cut in the shortening and butter until the mix looks like small crumbs . Add water a little at a time and cutting it in a bit and mixing with your fingers, DO NOT over work the dough or you will have a tough pastry. Roll up the dough into a log shape about 3 inches in diameter and wrap in plastic. I find that rolling into the log and then later cutting into discs makes it easier to work with, rather than trying to work with a large amount of dough at once. Refrigerate for 2 hours or overnight. Remove dough from fridge, and let sit for 30 minutes or so. You can also remove the meat mixture at this time if cooling in the fridge. If using a large cutting board , put a damp towel underneath so it won’t move around while rolling the dough. Lightly flour surface. Unwrap dough, and cut into 12 circular discs. 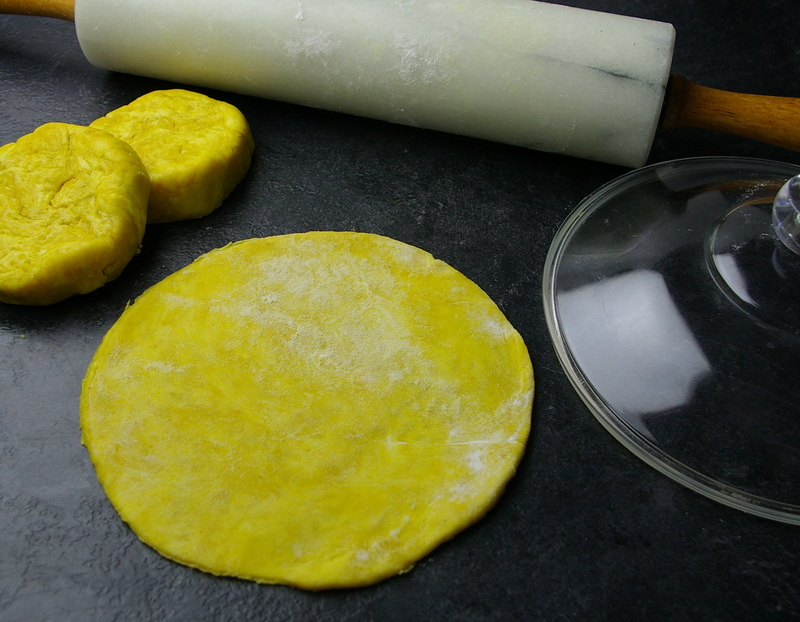 Place one disc in palm of hand and using both hands press with palms to flatten out the disc a little and round the edges, then sprinkle a little flour on top of the disc so that the rolling pin does not stick to the dough. Roll out each disc to about 1/8 inch , roll in one direction at a time don’t roll back and forth. The disc should be 7 inches in diameter. I use a 7 inch lid of a plastic jug to cut it into a perfect circle. Take the egg yolk, mixed with a few drops of water, and brush the edges of the round circle, this will help the edges stick together. Place ¼ (59mL) cup of the meat mix onto the centre. Fold the dough over and pinch closed with a fork, then lightly brush some of the egg yolk over the dough to help give it a nice brown color while cooking. Place on baking sheet lined with parchment paper, and cook at 400º for 25 minutes, or until lightly browned. 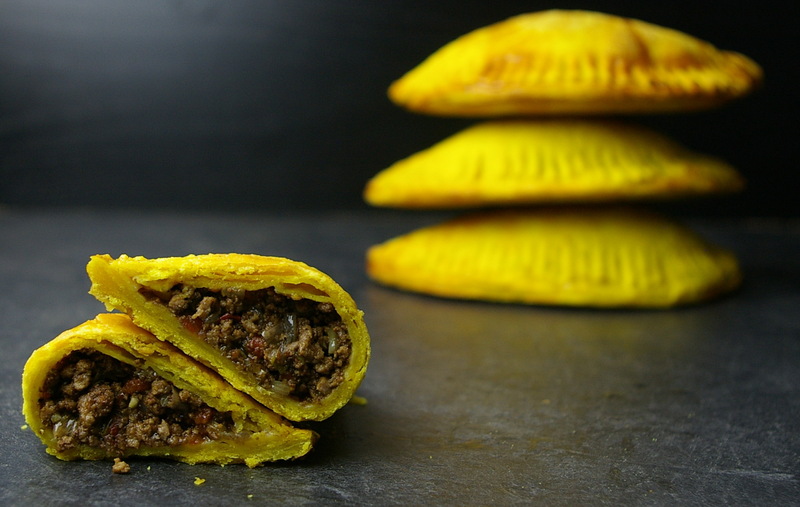 Remove from heat and place the finished patties on a cooling rack. Makes 12 7 inch patties. 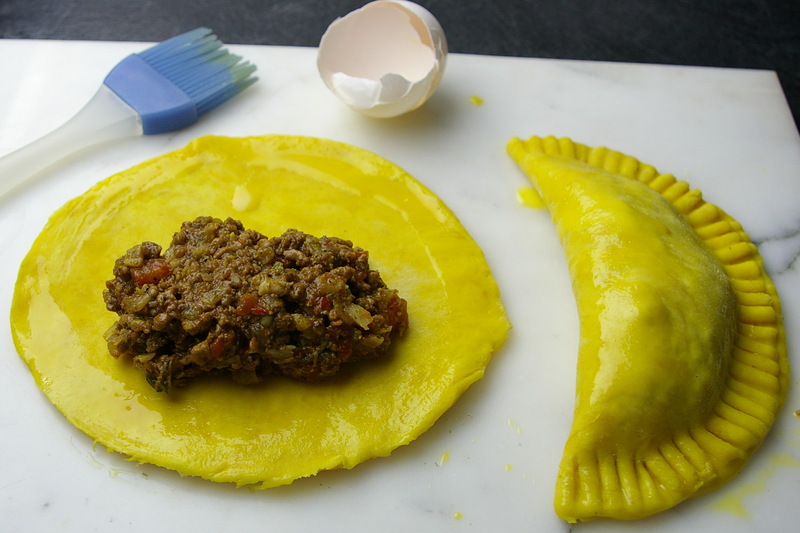 This entry was posted in Beef, Home and tagged beef, Jamaican, Pastry, Patties, Spicy by Ginger Smoothy and Otto Pilot. Bookmark the permalink. These look so good! 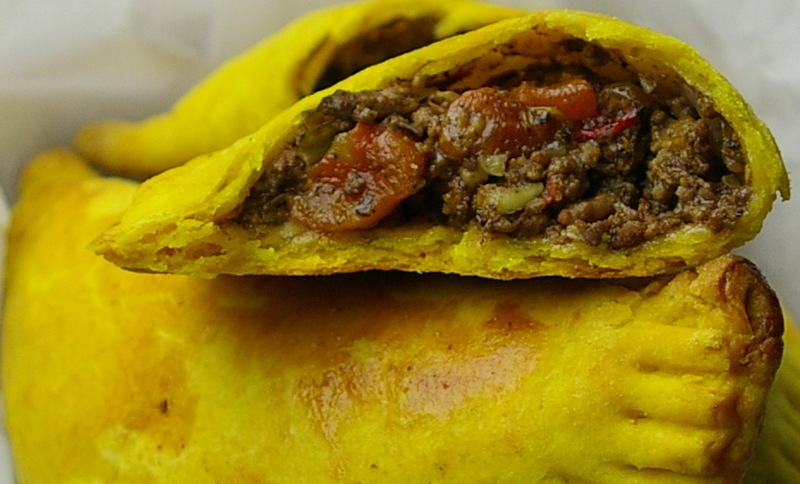 I haven’t made Jamaican patties in years … Thanks for the memory jog! Thanks, people always think they are alot of trouble , but if you make the dough and filling one day, you can put them together and cook the next day and it doesn’t seem like too much trouble. Excellent, I can use a touch of Caribbean Food now that the days get colder. Looks delicious and creative photography arrangement, too. I will have to try these …. you make all these recipes look easy and fun to make!! It’s all about having fun, and not being afraid of trying new things Thanks for stopping by the site Linda ! I’m a Jamaican living in France and have never made patty but I will now. I have actually been trawling the net for the best patty recipe. Your instructions and pics have won me over. Yours is the only one I’ve seen with tomatoes added. Yummy and moist. Thanks for what looks like a winner. Wish i could get some Red Stripe here. Thank-you! I love this recipe. Sometimes if I am too tired to make the patties, I just mix the filling with some rice or wrap it up in egg roll wrappers like Jamaican style egg rolls !